2016 has been a heck of year for many Nigerian, especially for the entrepreneurs. There has been a lot of Ups and Downs with the latter been the major. The economic recession in Nigeria has left no stone unturned as, as both the corporate workers and the entrepreneurs received their own share from the unstable economy. Irrespective of the state of the economy, a quite number of entrepreneurs distinguished themselves from the crowd and such actions cannot go unnoticed. The impact they make through their self created platforms or other available platform. Social Media Presence: since the inception of Dot Com rush, internet credibility has become one of the necessary things an individual should possess. The influence they wield in their respective sectors. NB: it should be noted that this is not a list of the richest entrepreneurs in Nigeria, as our standard of ranking does not include their net worth. Seun is one of the top internet entrepreneurs in Nigeria. He is the founder of Nairaland, an online forum, which is considered the biggest forum in Africa. The influence his platform has over Nigeria, has earned him a spot on our list as the 10th most influential entrepreneur in Nigeria for the year 2016. Ifeanyi Ubah is a business tycoon who hails from the commercial city of Nnewi, in Anambra state. He is the founder of Capital oil and gas which has its slogan as “The Nation’s Oil Giant”. He is no new name in Nigeria as his contribution to the football sector and oil sector in Nigeria has made headlines over the time. He is also the owner of the Authority News Paper. Even the least person in Nigeria, when sick can afford N30 to purchase an Emzor paracetamol. This is made possible by the entrepreneurial nature of Stella who is the founder of Emzor Pharmaceuticals, a well known pharmaceutical company in Nigeria. She is among the few female in Nigeria that promotes entrepreneurship. Her program “Chike Okoli Centre for entrepreneurial studies, has presence in different universities in Nigeria including the famous Nnamdi Azikiwe University. Mr Olaoluwa is the current CEO/MD of the bank of industries. After graduating with first class in civil engineering from a Nigerian university, he went on to acquire an MBA degree from International Graduate School of Management Spain. The bank of industries under his administration launched a N10 billion youth entrepreneurship support scheme, aimed at boosting the entrepreneurship sector in Nigeria. Little cannot be said about the founder of Innoson Vehicle Motors. His company is regarded as the first indigenous motor manufacturing company in Nigeria. His company, the Innoson group has presence in different business sectors including ICT sector. The company is also regarded as the largest producer of plastics in West Africa. On 25th October 2016, the Innoson Group signed a Billion dollar deal with Chinese Investors, a deal which will foster the introduction of smart city in different cities in Nigeria. A British Born Nigerian entrepreneur and a film magnate, Jason is the founder of iROKO Tv, which is the best Video-On-Demand movie platform for Nigerian Movies. He is also a startup investor. Iroko tv is his 11th attempt to startup a business. His has been awarded one of the “Fast company Top 1000 most creative people in Business. The influence and impact of his company in the distribution of Nollywood movies around Africa and the world at large earns a place on our list. Mike Adenuga as he is popularly called is the second richest person in Nigeria. He is the founder of Globacom, the 2nd largest telecom operator in Nigeria. He also owns stakes in Equitorial Trust Bank and the oil exploration from conoil. His influence in the telecom sector has gotten our attention. Who doesn’t know the highest paid blogger in Nigeria? The former model is the owner of lindaikejis blog. She recently extended her entrepreneurial tentacles by launching her own social network named Linda Ikeji’s social, a social network which is rumored to have 50,000 sign ups on the first day of its launch. She also runs a nonprofit project themed “I do rather be self made; No thanks”, where she gave out the sum 10 million naira in the first phase of the project. Ben Bruce is the founder of Silverbird Group. He is an active projector of made in Nigeria products. He is always seen showing off the pictures of Made in Nigeria Product in his social media account. He wields much influence in the media sector. He was once the director of NTA from 1999 to 2003 and also the host of the Most Beautiful Girl in Nigeria Pageant which he began in 1986. His Philanthropic Nature, active support of made in Nigeria Product and his influence in the media makes him worthy to be our second influential entrepreneur in Nigeria. Tony Elumelu is the founder of Heir Holdings, the chairman of United Bank for Africa and the Transnational Corporation of Nigeria where he is a major shareholder. He has two degrees from a Nigerian university, a bachelor degree from Ambrose Ali University and a Master Degree from University of Lagos. He is also an Alumnus of Harvard Business School. After, he retired from UBA bank. He went on to open Tony Elumelu Foundation, an organization that aims to promote entrepreneurship in Nigeria and Africa at large. His foundation also empowers entrepreneurs who demonstrate leadership potential and credible business ideas. Tony Elumelu serves as a member of the Global Advisory Board of United Sustainable Energy for all Initiative and USAID’s private capital group for African Partners Forum. He is also the vice chairman of the national competitiveness council of Nigeria. 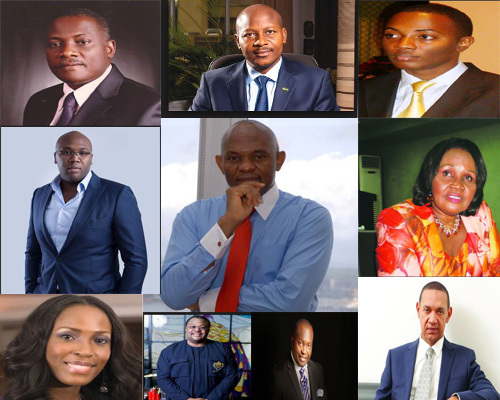 Tony Elumelu’s influence in the business sector in Nigeria, the impact he renders through his Non Profit Organization has made him the Cresthub Number One Influential Entrepreneur in Nigeria 2016. No.1 website for StartUp in Nigeria and Africa. thanks man. the cresthub staff did a good work. great post. cresthub is the best! i can’t go past a day without checking this site. well, i was expecting to see Dangote there. anyway nice list. oh i love this. your list is quite insightful. i look forward to paying a visit to Nigeria. haha cool. keep it up. You can always tell an expert! Thanks for courtibnting. there are many entrepreneurs in Nigeria, you should write more about them. Thumbs up. Hi There! We are looking for some people that are interested in from working their home on a part-time basis. If you want to earn $200 a day, and you don’t mind writing some short opinions up, this is the perfect opportunity for you! Simply click the link here NOW! i thought Dangote is among the influential entrepreneurs in Nigeria. wow, Nigeria has a lot of entrepreneurs. Quicker and Easier than the SBA, http://BusinessCapitalAdvisor.com can get your business a loan for $2K-350,000 With low-credit and without traditional personal guarantees or collateral. If you’ve been established for at least a year you are already pre-qualified. Our Fast service means funding can be finished within 48 hours. Terms are specific for each business so I suggest applying to find out exactly how much you can get. Simply awesome. jp keep it up. It is remarkable, very valuable information . My wife and i ended up being quite cheerful that Raymond managed to round up his investigations via the ideas he received from your very own web page. It is now and again perplexing to just be making a gift of procedures which often the rest might have been making money from. And now we already know we now have you to be grateful to because of that. These explanations you have made, the simple web site menu, the friendships you will make it easier to instill – it’s got most amazing, and it is aiding our son and the family imagine that that situation is brilliant, and that’s very vital. Many thanks for the whole lot! I am just writing to let you be aware of what a cool experience my princess undergone reading your web site. She even learned lots of things, not to mention what it is like to have an excellent giving style to let many people clearly comprehend a number of tricky things. You actually surpassed her expected results. Many thanks for offering the interesting, trusted, educational as well as cool guidance on this topic to Janet. Hi there! I just wish to give an enormous thumbs up for the nice information you’ve right here on this post. I will likely be coming again to your blog for more soon. Aw, this was a very nice post. In thought I wish to put in writing like this moreover ?taking time and actual effort to make an excellent article?however what can I say?I procrastinate alot and by no means seem to get something done. I’m writing to let you understand what a cool encounter our daughter encountered reading the blog. She picked up some issues, with the inclusion of what it is like to have an awesome coaching heart to let most people clearly grasp certain tricky issues. You truly surpassed visitors’ expectations. Thank you for rendering these necessary, trustworthy, edifying and as well as easy tips on this topic to Sandra. Aw, this was a really nice post. In idea I wish to put in writing like this moreover ?taking time and precise effort to make an excellent article?however what can I say?I procrastinate alot and certainly not appear to get something done. You made some decent factors there. I looked on the web for the issue and located most individuals. i certainly will get along with your website. When I initially commented I clicked the -Notify me when new feedback are added- checkbox and now every time a comment is added I get four emails with the identical comment. Is there any means you may remove me from that service? Thanks! Sure, Go to the footer of the notification message you received from us and hit the reverse button. Thank you for stopping by. Hi There! We are searching for experienced people that might be interested in from working their home on a full-time basis. If you want to earn $500 a day, and you don’t mind writing some short opinions up, this is the perfect opportunity for you! Simply check out the link here NOW! I was very pleased to seek out this net-site.I needed to thanks to your time for this excellent read!! I definitely enjoying each little bit of it and I have you bookmarked to take a look at new stuff you blog post. educative post. keep it on.